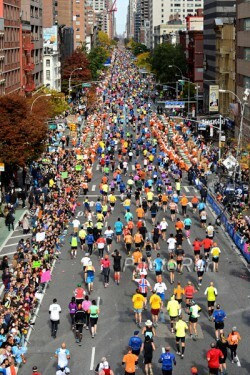 It is that time of the year again, when the arrival of autumn heralds great marathon races around the globe. Over the next few weeks, millions of spectators will watch the classic 26.2-mile contests in Berlin, Chicago, Frankfurt, New York City, and the Dutch cities of Amsterdam and Eindhoven. A year ago, Kenya’s Wilson Kipsang set an amazing new marathon world record of 2 hours, 3 minutes, and 23 seconds in Berlin—and it is quite possible that we could see the mark falling again for the fifth time in seven years. In Berlin, Dennis Kimetto of Kenya will have his sights set on Wilson Kipsang’s record, while in Chicago, the great distance-running champion Kenenisa Bekele will be competing in his second career marathon. In Frankfurt, the talented teenager Tsegaye Mekonnen of Ethiopia will be lining up with fellow countryman Getu Feleke. In addition to Berlin, Frankfurt and Chicago have course records of 2:03:42 and 2:03:45 respectively, which means exceptional results could be in store for both races as well. The times for the women’s competitions are expected to dip under 2:20 in all three events. 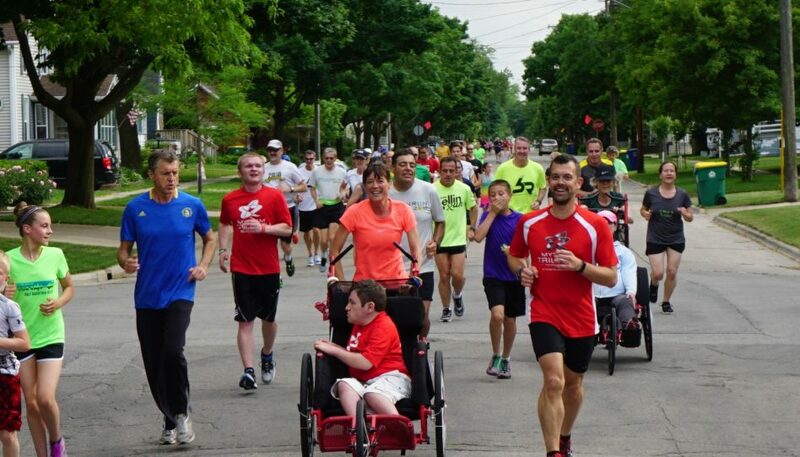 These marathons are not just for the elites. More than 175,000 men and women will be taking to the streets of Berlin, Chicago, Amsterdam, Frankfurt, and New York—and if there were not limits placed on the fields, that figure could easily rise by another 100,000. Since Paul Tergat of Kenya improved the world record in Berlin back in 2003 with a time of 2:04:55, the German capital has seen four more world records. This year, it could be Dennis Kimetto’s turn. The 30-year-old has the fastest seeded time, coming within 22 seconds of Wilson Kipsang’s world record in Chicago last year. Dennis confessed afterwards that during the race he was unaware how close he was to Wilson’s mark! Dennis is no stranger to world records in Berlin. At the 2012 edition of the Big 25 Berlin, he clocked 1:11:18—officially the fastest any human has run on the roads for 25K and a record that still stands. Two years ago, he had a stunning debut at the Berlin Marathon, taking second in 2:04:16 behind Geoffrey Mutai. The field that Dennis will be competing against is strong and includes Kenya’s Emmanuel Mutai (2:03:52), Levy Matebo (2:05:16) and Eliud Kiptanui (2:05:39), as well as Tsegaye Kebede (2:04:38) of Ethiopia. Five runners with times this fast have never started in Berlin before, and Emmanuel and Tsegaye are expected to give Dennis Kimetto his fiercest competition. Meanwhile, in the women’s race, American Shalane Flanagan is aiming to dip under 2:20 in Berlin, hoping to capitalize on Berlin’s speedy course to better Deena Kastor’s American marathon record of 2:19:36, set back in London in 2006. 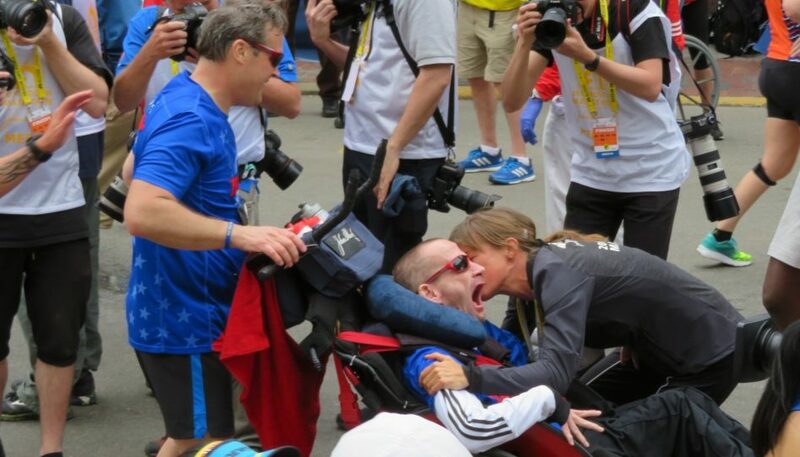 Shalane’s personal best time is currently the 2:22:07 she ran in taking seventh at the Boston Marathon this spring. Two of her strongest competitors in the field will be Feyse Tadese and Tirfi Tsegaye—both from Ethiopia. Feyse clocked a 2:21:06 in Paris, while Tirfi ran 2:21:19 two years ago in Berlin, when she took second. The 29-year-old Tirfi has already won three big marathons: 2012 in Paris, 2013 in Dubai, and this February in Tokyo, one of the World Marathon Majors races. The Ethiopian duo is perfectly capable of keeping up with a fast pace, and Mizuki Noguchi’s course record of 2:19:12—set 9 years ago—could be challenged. After her impressive first-place showing at the Vienna Marathon in April, Anna Hahner will run her second marathon of the year in Berlin. The 24-year-old German hopes to improve on her existing PR (2:27:55), set a year ago in Frankfurt. You can read more about Anna here on our Website. The 37th edition of the Bank of America Chicago Marathon features Kenenisa Bekele, the world-record holder in the 5,000m and 10,000m on the track. In April, Kenenisa made his marathon debut in Paris with a time of 2:05:04—good for a course record. In Chicago, however, he will need to run even faster if he is to go under Dennis Kimetto’s mark of 2:03:45. It means that Kenenisa’s pace will have to be in the range of Wilson Kipsang’s world record. Kenenisa’s strongest competition may come from Kenya’s Eliud Kipchoge. The two have already battled each other at the 5,000m in the 2003 World Championships in Paris, where Eliud prevailed. 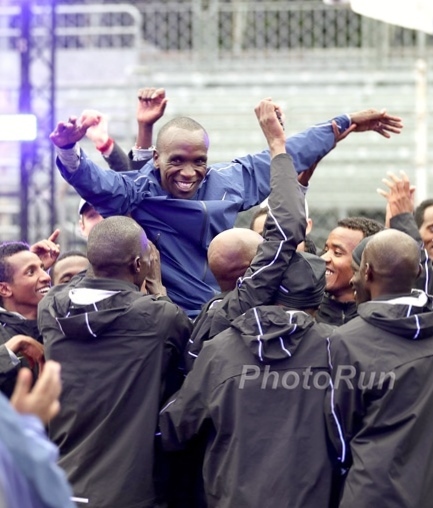 Last year in Berlin, he crossed the finish line behind Wilson Kipsang in 2:04:05. Another runner to watch in Chicago is Lani Kiplagat Rutto, who is coached by Take The Magic Step’s Dieter Hogen. The women’s race features an intriguing duel between the defending Chicago champion Rita Jeptoo (2:18:57 PR) of Kenya and her compatriot Florence Kiplagat, who won the 2013 edition of the Berlin Marathon and set the world half-marathon record this spring (65:12). Can the World Junior Champion Tsegaye Mekonnen Prevail in Frankfurt? Ethiopian marathoners may also lead the way in Frankfurt. Race director Jo Schindler and the elite athlete coordinator Christoph Kopp have recruited 19-year-old Tsegaye Mekonnen, who made an incredible debut (2:04:32) at the Dubai Marathon earlier this year. The strong finishing kick he showed that day has many in the running world wondering what kind of time he can achieve in Frankfurt. Tsegaye will be pushed by Getu Feleke (2:40:50), who came back from health problems to win the Vienna Marathon this spring with a course record 2:05:41. Also in the mix is Allan Kiprono, who is a member of Dieter Hogen’s training group and will be making his marathon debut. The fastest woman in Frankfurt is two-time Berlin champion Aberu Kebede (2:20:30) of Ethiopia, but she will face tough competition from Kenya’s Sharon Cherop (2:22:28). On the first Sunday in November, thousands of runners will follow the streets of New York City from Staten Island to Manhattan. The men’s race sets up a highly-anticipated rematch between Wilson Kipsang, the world record holder, and Geoffrey Mutai, the course-record holder, who has also run the fastest unofficial marathon time of 2:03:02. The two men have already raced against each other once this year—in London, where Wilson prevailed and Geoffrey placed sixth overall. So who is the pre-race favorite? It appears that Geoffrey Mutai has the slight edge. In the past few weeks the reigning New York City champion has shown good form, running 27:32 in a 10K in Prague earlier this month, while Wilson Kipsang had to pull out of a half marathon in Wörthersee, Austria due to injury problems. Still, a win for Geoffrey will not come easily. And there are seven other runners on the start list for that race with times under 2:07. Also notably in the field are Olympic gold medalist Stephen Kiprotich of Uganda (2:07:20) as well as former New York City and current Boston Marathon champion Meb Keflezighi (2:08:37). The women’s race promises to be memorable, with three runners with best times under 2:20 at the starting line: Kenya’s Mary Keitany (2:18:37) and world champion Edna Kiplagat (2:19:50) as well as Ethiopia’s Buzunesh Deba (2:19:59). 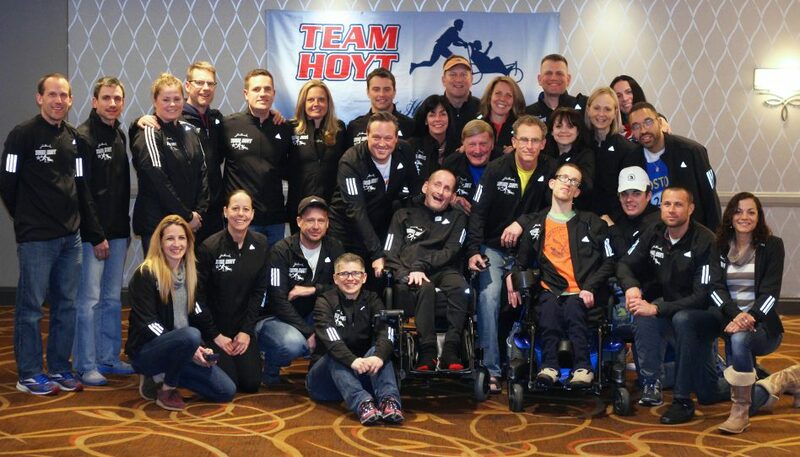 Joining this impressive group will be defending champion Priscah Jeptoo of Ethiopia (2:20:14). New York City will mark a marathon comeback for Mary Keitany, who took time off to have a child. Her recent victory at the Great North Run half marathon in Newcastle, England, is a good indicator of her form—she blazed 65:39 minutes to run the second-fastest half marathon of all time and set a new course record that once belonged to Paula Radcliffe, the British world-record holder in the marathon. Given this depth of talent in New York, there is a good chance that Margaret Okayo’s course record (2:22:31) will fall. In Amsterdam, the favorite, Ethiopian Ayele Abshero (2:04:23), will face two Kenyan contenders: Abel Kirui (2:05:04) and Wilson Chebet 2:05:27. 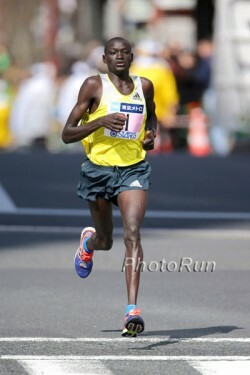 Abel Kirui is a former world champion, while Wilson Chebet goes by the nickname “Mr. 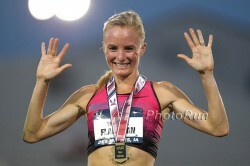 Amsterdam” after winning the race three times in a row and owning the course record of 2:05:36. The Eindhoven Marathon kicks off a week before Amsterdam on October 12, and Leonard Komon of Kenya, the world-record holder in the 10K, will be making his debut over the marathon distance. This spring, he ran the fastest half-marathon debut of all time in Berlin (59:14). In Eindhoven, he faces compatriots Jonathan Maiyo (2:04:56) and Jafred Kipchumba (2:05:48). The women’s fields for the two Dutch races are still being decided. Frankline Chepkwony (KEN/2:06:11), Geoffrey Kamworor (KEN/2:06:12), Kazuhiro Maeda (JPN/2:08:00), Ryo Yamamoto (JPN/2:08:44), Maswai Kiptanui (KEN/2:08:52), Abera Kuma (ETH/2:09:53), Scott Overall (GBR/2:10:55), Falk Cierpinski (SG Spergau/2:13:30), Markus Weiß-Latzko (Sparda-Team Rechberghausen/2:18:06). Gengenbach/2:27:55), Ines Melchor (PER/2:28:54), Tadelech Bekele (ETH/debut). Women: Rita Jeptoo (KEN/2:18:57), Florence Kiplagat (KEN/2:19:44), Jemima Sumgong (KEN/2:20:48), Birhane Dibaba (ETH/2:22:30), Amy Hastings (USA/2:27:03), Clara Santucci (USA/2:29:54), Becky Wade (USA/2:30:41), Lisa Uhl (USA/debut). Men: Ayele Abshero (ETH/2:04:23), Abel Kirui (KEN/2:05:04), Wilson Chebet (KEN/2:05:27), Marilson dos Santos (BRA/2:06:34) – the women’s field is unknown. Men: Tsegaye Mekonnen (ETH/2:04:32), Getu Feleke (ETH/2:04:50), Deribe Robi (ETH/2:08:02), Tebalu Zawude (ETH/2:08:20), Daniel Chepyegon (UGA/2:08:24), Paulo Almeida Paulo (BRA/2:10:23), Dawit Wolde (ETH/2:10:42), Edwin Kemboi (AUT/2:12:58), Shadrack Biwott (USA/2:13:26), Julian Flügel (LG Telis Finanz Regensburg/2:15:39), Frank Schauer (SC Magdeburg/2:18:57), Dennis Pyka (LG Telis Finanz Regensburg/2:19:17), Adugna Takele (ETH/debut), Daniel Wanjiru (KEN/debut), Philipp Pflieger (LG Telis Finanz Regensburg/debut), Manuel Stöckert (SC Ostheim Rhön/debut), Arne Gabius (LAV Stadtwerke Tübingen/debut), Allan Kiprono (KEN/ debut). Women: Aberu Kebede (ETH/2:20:30), Sharon Cherop (KEN/2:22:28), Maria Konovalova (RUS/2:22:46), Flomena Chepchirchir (KEN/2:23:00), Helah Kiprop (KEN/2:26:27), Ashete Bekere (ETH/2:27:47), Winny Jepkorir (KEN/2:27:57), Adriana Nelson (USA/2:28:52), Emily Ngetich (KEN/2:30:50), Mona Stockhecke (LT Marathon Hamburg/2:34:04), Nina Stöcker (Eintracht Frankfurt/2:37:46). Men: Geoffrey Mutai (KEN/2:03:02), Wilson Kipsang (KEN/2:03:23), Gebre Gebremariam (ETH/2:04:53), Stanley Biwott (KEN/2:04:55), Peter Kirui (KEN/2:06:31), Michael Kipyego (KEN/2:06:48), Micah Kogo (KEN/2:06:56), Stephen Kiprotich (UGA/2:07:20), Lusapho April (RSA/2:08:32), Meb Keflezighi (USA/2:08:37). Women: Mary Keitany (KEN/2:18:37), Edna Kiplagat (KEN/2:19:50), Buzunesh Deba (ETH/2:19:59), Priscah Jeptoo (KEN/2:20:14), Desiree Linden (USA/2:22:38), Jelena Prokopcuka (LAT/2:22:56), Firehiwot Dado (ETH/2:23:15), Valeria Straneo (ITA/2:23:44), Kara Goucher (USA/2:24:52), Ana Dulce Felix (POR/2:25:40), Sara Moreira (POR/debut), Rkia El Moukin (MOR/debut). 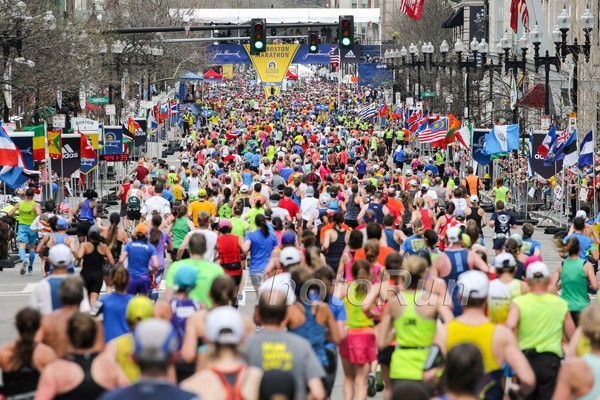 *Times set at the Boston Marathon cannot be recognized as official records since the course does not meet IAAF requirements (max. drop of one meter per kilometer, start and finish should be a max. 50% of the course distance apart.). 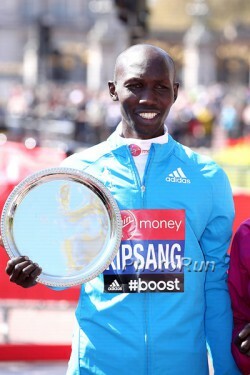 2:03:23 Hours Wilson Kipsang KEN London (GBR) 04.13. 2:04:32 Tsegaye Mekonnen ETH Dubai (UAE) 01.24. 2:04:55 Stanley Biwott KEN London (GBR) 04.13. 2:05:00 Eliud Kipchoge KEN Rotterdam (NED) 04.06. 2:05:04 Kenenisa Bekele ETH Paris (FRA) 04.06. 2:05:13 Markos Geneti ETH Dubai (UAE) 01.24. 2:05:41 Getu Feleke ETH Wien (AUT) 04.13. 2:05:42 Dickson Chumba KEN Tokio (JPN) 02.23. 2:05:49 Girmay Birhanu ETH Dubai (UAE) 01.24. 2:05:57 Tadese Tola ETH Tokio (JPN) 02.23. 2:20:21 Hours Edna Kiplagat KEN London (GBR) 04.13. 2:20:24 Florence Kiplagat KEN London (GBR) 04.13. 2:20:35 Tirunesh Dibaba ETH London (GBR) 04.13. 2:21:36 Mare Dibaba ETH Xiamen (CHN) 01.02. 2:21:42 Feyse Tadese ETH London (GBR) 04.13. 2:22:23 Tirfi Tsegay ETH Tokio (JPN) 02.23. 2:22:30 Berhane Dibaba ETH Tokio (JPN) 02.23. 2:22:44 Flomena Cheyech Daniel KEN Paris (FRA) 04.06. 2:23:21 Aberu Kebede ETH London (GBR) 04.13. 2:23:34 Firehiwot Dado ETH Prag (CSZ) 05.11. One WMM series takes place over a two-year period. Both winners receive a $500,000 prize. The top-five places of WMM races receive points in the following order (25, 15, 10, 5, and 1). The 2013-2014 series concludes after the races in Berlin, Chicago, and New York. 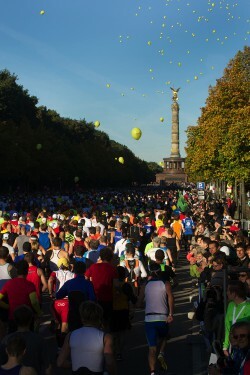 For more information please visit www.WorldMarathonMajors.com finden.